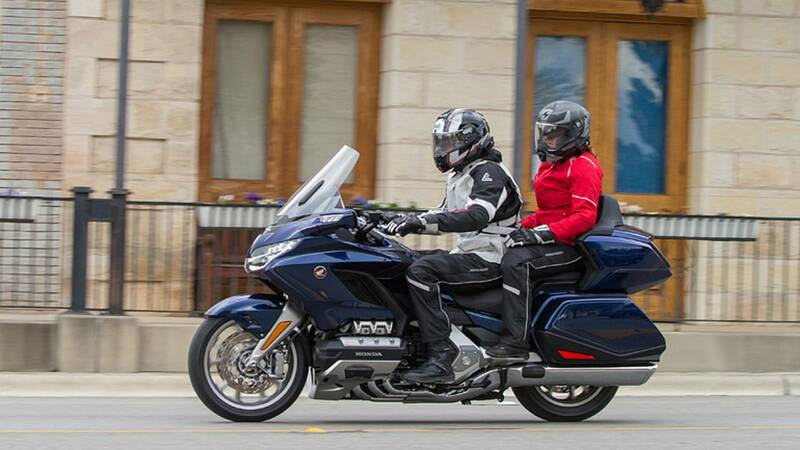 Adam rode the new 2018 Honda Gold Wing and found it faster, more agile, and more competent overall than its predecessors. Although it didn’t know it at the time, Honda practically invented the luxury touring segment with its Gold Wing. Over the course of its 43 year history, the motorcycle steadily grew into one of the most capable touring bikes the world has ever seen. Sadly, as we all know, age and too much of the good life can leave you, well… kinda chubby. For 2018 engineers remedy this — chiseling away 86 pounds leaving a leaner and meaner Gold Wing. 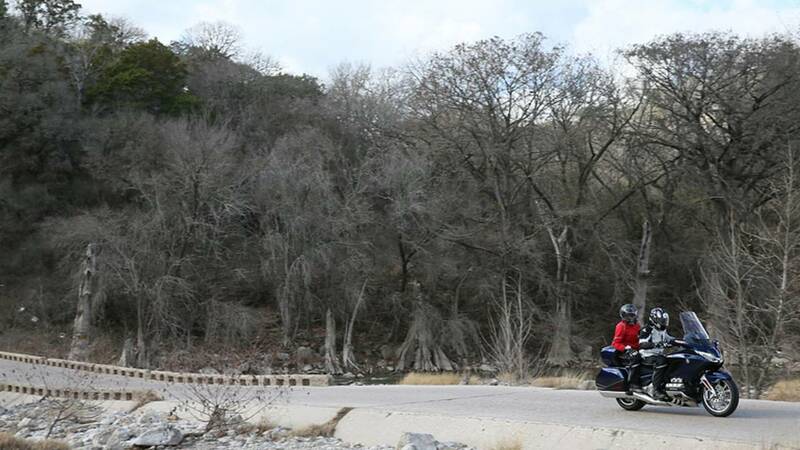 I came away impressed after a weather-shortened day ride in Austin, Texas, during its official global press introduction. Since pretty much forever, one of the many claims to Gold Wing fame is its regal ride quality. 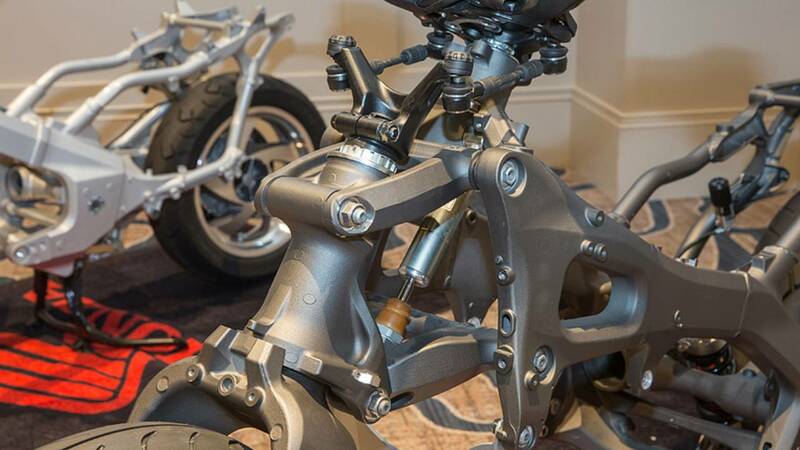 With the introduction of Honda’s double-wishbone front suspension, the bike's comfort advances to a level few have ever experienced on a motorcycle. The new 'Wing trades a conventional telescopic fork for a more complex setup that includes a swingarm-like front fork operating through a pair of control arms and steering tie-rods. This isolates steering from suspension movement, substantially reducing turning effort at any speed. It also allows the suspension to travel in a more upward trajectory. This enabled engineers to position the horizontally opposed six-cylinder engine and rider more forward. 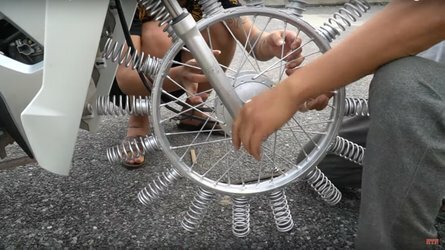 Thanks to this new suspension setup, the bike glides across the pavement shielding rider and passenger from bumps, ripples, and any imperfection. Out back, a concealed Showa shock absorber provides damping control corresponding to the engine’s combined power/throttle response modes. I'll touch on that later. The bike's handling felt natural and sure-footed at any speed. Although deep bends are few and far between in Texas, the Honda felt agile for a 833-pound machine and had a surprising level of ground clearance, even two-up. The redesigned rear suspension continues to benefit from electronically adjustable spring preload, making it push-button easy to modify ride height based on handling preference or load. I preferred the highest setting with no perceived negligible effect on comfort. I look forward to more twisty road seat time in the future. Heavier-duty brake hardware keeps speed in check. The front rotors are a beefy 320mm, and they’re clamped by sportbike-style, radial-mount, six-piston calipers. Electronically controlled ABS and front/rear combined braking help maintain vehicle control in sketchy or panic situations. As mentioned earlier, the ergonomics were overhauled as well for this year. The rider sits 1.4 inches farther forward, the handlebar is more frontward, and the foot pegs have shifted back. This makes a more natural riding position with more even proportions. An electronically adjustable windshield improves comfort even further, and provides a clean, quiet pocket of air in its highest position. There’s a range of 4.9 inches between highest and lowest setting, and a manual flap allows air to enter the cockpit if desired. If the factory windscreen isn’t quite tall enough, a taller option is available at an up-charge. Unladen seat height is a fraction higher – 0.2 inches – but that's offset by the reduced girth everywhere. 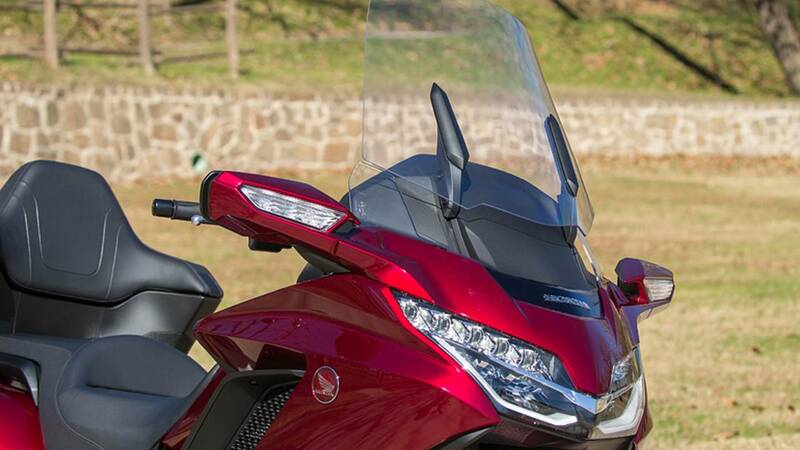 From nose to tail the new Gold Wing is narrower than its predecessor. The saddle itself is sized generously for the rider with a rearward lip that helps hold you in place. The raised passenger section is a tad smaller, but benefits from full back support courtesy of the top case. 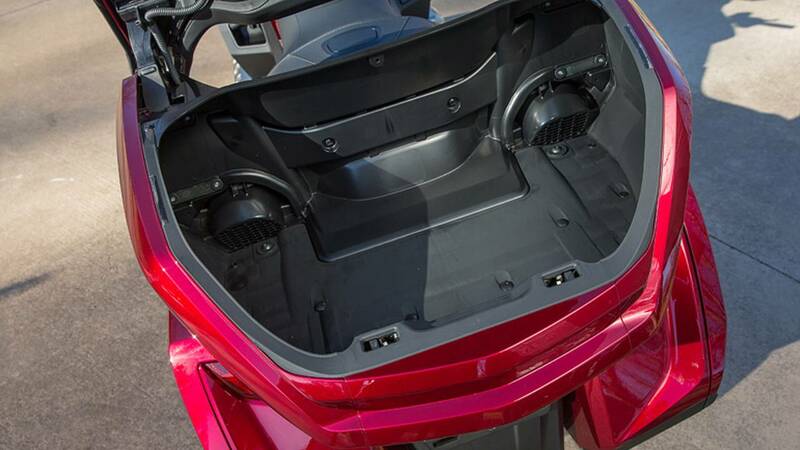 Again, Honda offers optional rider backrest and accessory passenger grab handles. 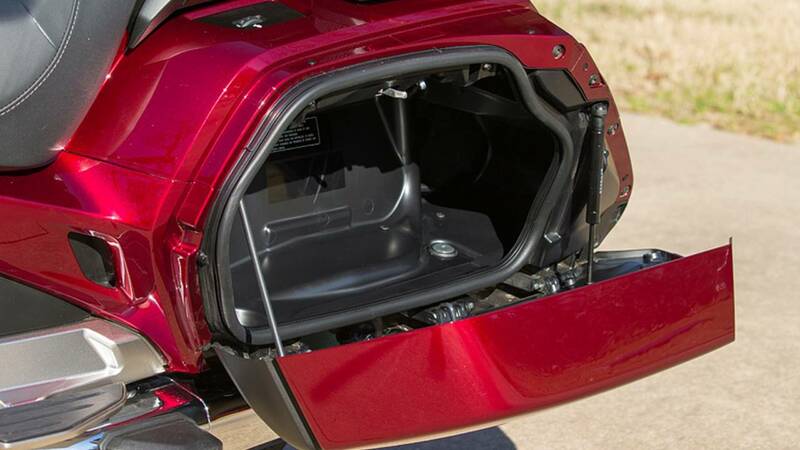 They also include top case removal hardware so you can “drop the top” and temporarily turn your touring bike into a bagger. Of course, a Gold Wing wouldn’t be a Gold Wing without a bevy of technological do-dads and creature comforts. The switch gear was completely re-vamped with an eye toward reducing complexity and the number of buttons. Two joysticks – one at the center of the cockpit and one of the left handlebar – allow the rider to scroll through the slick menu system displayed on the seven-inch color display. This display is flanked by a pair of swept face speedometer and tachometer gauges affording the best of both instrumentation worlds. There are a pair of smaller LCD displays in the bottom corner of the panel that show more particulars, including things like tire air pressure, fuel statistics, and other vehicle info. Although we preferred using the center joystick knob, its function is only enabled when the motorcycle is at a standstill. The menu is laid out logically — as evidenced by the fact that it took mere seconds for me to pair a Sena 30K Bluetooth headset and iPhone once I powered the bike on. 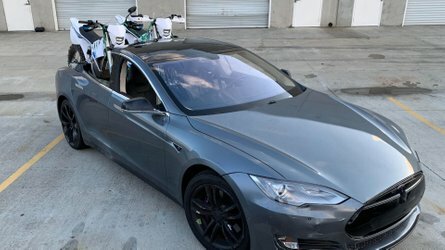 For a rider to fully immerse himself in on-board connectivity though, he has to physically plug in his iOS-equipped device (sorry Android users) via the USB port inside the front center pocket. This activates Apple’s proprietary CarPlay, permitting the rider to manipulate their phone while riding via joystick or voice commands. The electronics perform adeptly, permitting talk and text while riding simply by using your voice. As an added bonus, instrumentation is positioned in such a way to not overly distract from the road ahead. Of course, you can access a variety of smartphone features simply via Bluetooth, but it likely won’t be as slick as CarPlay. 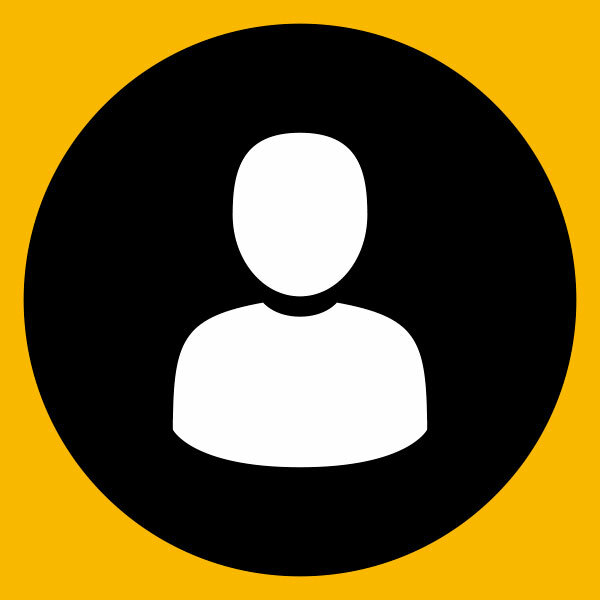 GPS navigation is standard so there’s no need to rely on Apple or Google Maps for routing. The info displays and CarPlay are complemented by a four-speaker stereo system that can be easily switched on/off, along with headset control via a dedicated button on the center panel. We didn’t play around too much with the speakers but the setup performed without issue. I can’t wait until warmer season rides when the tunes can really be cranked up. Heated rider seat and grips are standard, and can be manipulated via a separate dedicated button to keep you nice and toasty on chilly mornings. With the addition of ride-by-wire technology, cruise control functionality is more precise than before with it having greater speed holding ability uphill or down. Old school CB radio users may be saddened that this GL isn’t outfitted with the equipment standard, but it is available as an accessory. In fact, Honda offers an expansive line of goodies including LED fog lights, air deflectors, and a back rest allowing you to tailor the ‘Wing to your liking. Although rich in torque and buttery smoothness, the Gold Wing’s six-cylinder engine has historically had a muted personality. Not anymore. 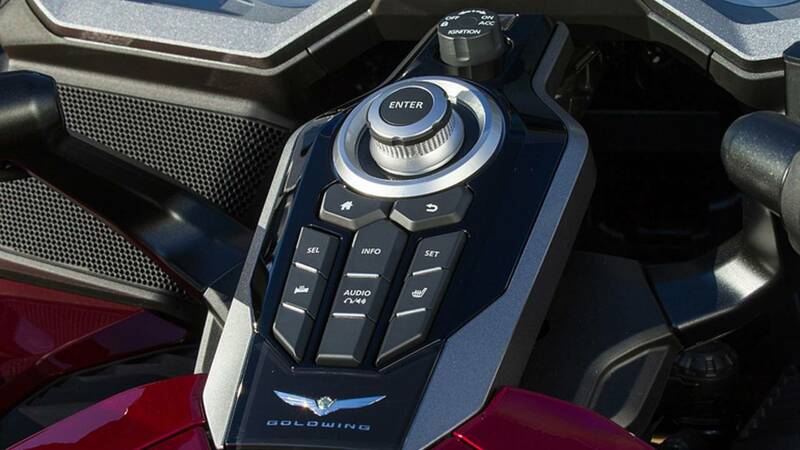 With the addition of ride-by-wire control – in which the throttle body is controlled through a computer instead of an old school mechanical cable connection – today’s Gold Wing can go from mild to wild with a push of a button. By default the GL runs in the Tour setting, which is a nice blend of engine response and everyday use. There's also an Econ mode that mutes engine response slightly to increase efficiency, and Rain mode which really clamps down on the engine to make dealing with treacherous road conditions easier. For those desiring the utmost in performance and fun-loving sport attitude, there’s the aptly named Sport setting. Enabling this mode gives the Gold Wing the personality we’d expect from a CBR1000RR. Complemented by a deeper and more robust sounding exhaust note, this ain’t no old man’s ‘Wing. While plenty entertaining, it can be a tad overkill for straight-line rides making ‘Tour’ our go-to setting. Still, it’s nice to know you can crank things up, on demand. Each riding mode is tied to a corresponding level of “torque control” – Honda’s version of traction control – which can be manually disabled. Like most high-end TC systems, it manages traction via throttle opening and fuel delivery. 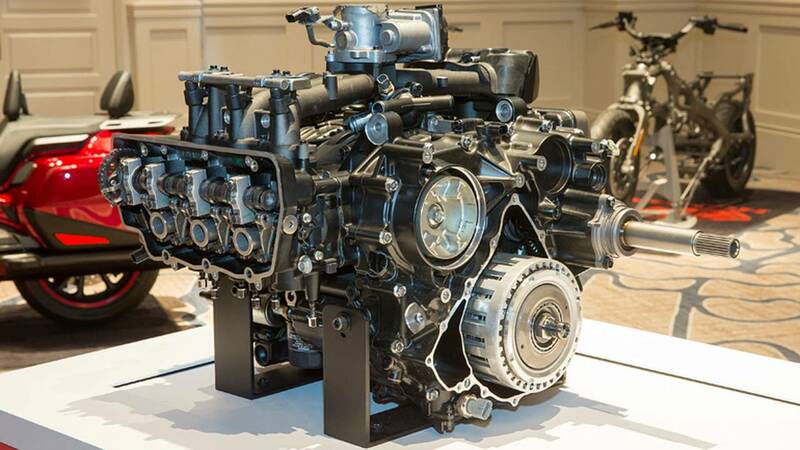 Nearly 14 pounds lighter and substantially more compact, the next generation, 24-valve six-cylinder impresses with its more pleasing power and feell. It pulls more cleanly – especially at low rpm – and retains its signature smoothness and vibration-free experience. Honda claims top end horsepower is up, as is the torque curve from bottom to top. It certainly feels that way based on the engine’s more eager response when the throttle is twisted. Our test bike was outfitted with the six-speed manual gearbox, a transmission which came close to never making it to production according to American Honda. 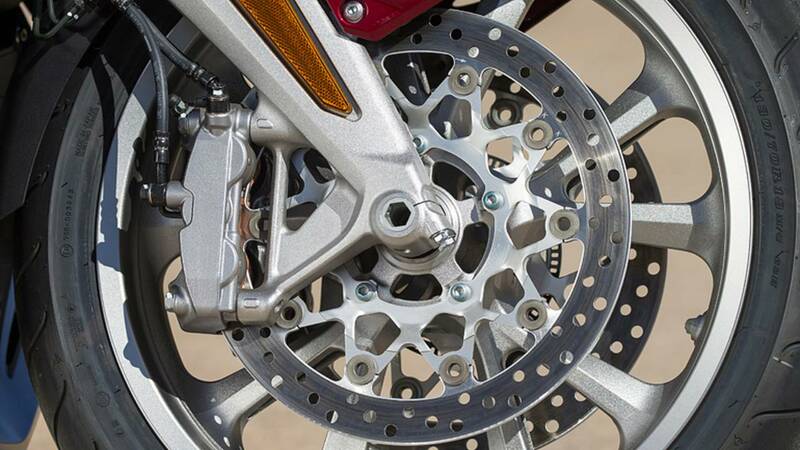 The updated oil-bathed clutch forces clutch plates together (for more bite) during acceleration and apart when decelerating. This reduces clutch lever pull by 20 percent and helps eliminate instability when downshifting if you're in the wrong gear. In the gearbox, first, fourth, fifth, and sixth gear got taller, and second and third got shorter. This keeps the engine spinning in the prime of it power band while reducing RPMs when cruising at freeway speeds. There’s also a push-button enabled reverse mechanism to help you back out of tight spots. 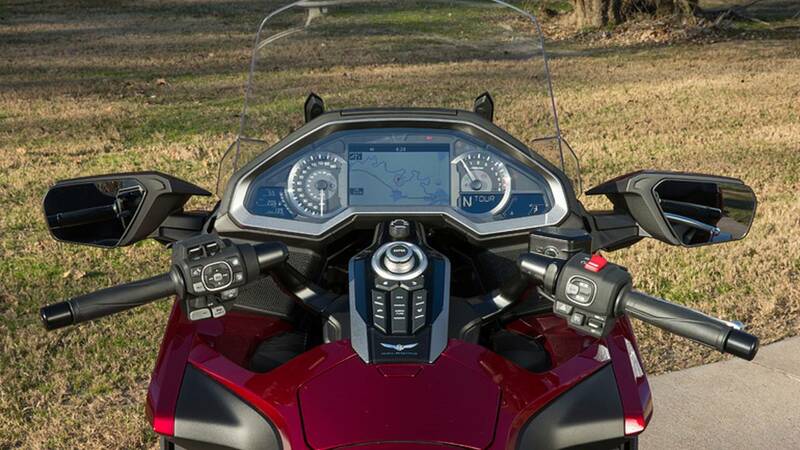 One feature that most Gold Wing fans are sure to bemoan is the reduction in storage capacity. Specifically, the top case is 20 percent smaller – enough to make it tough to fit two full-face helmets without having to turn them on their side or other puzzle piece maneuvers. Honda says it has a list of full-size helmets that are compatible with the update configuration. Along with the smaller top case, the panniers are smaller too. Volume inside each is decreased by 38 percent, from 41.5 to 30 liters. In addition, their molded curvature makes it tricky to utilize space to its fullest. Additional stowage is available under the center control panel, but the optional Airbag occupies this area when equipped. 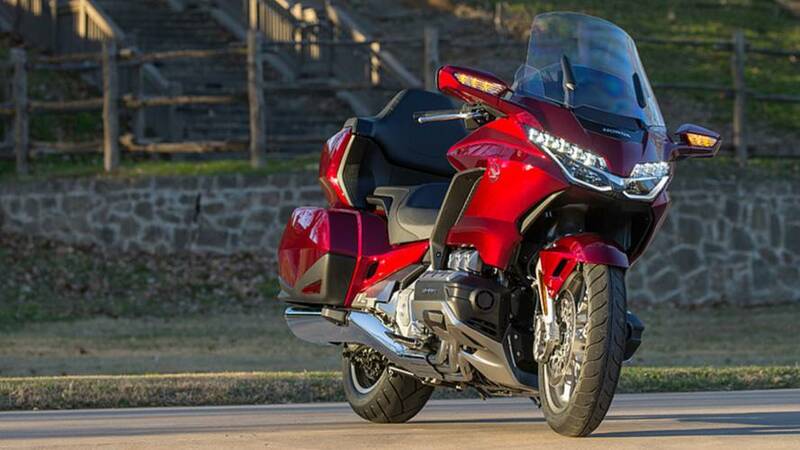 Honda deems the 2018 Gold Wing Tour as an “Advanced Performance Touring Machine”. After our nearly 200-mile ride, we think it’s an apt handle. Lighter, quicker, and more playful to pilot, Big Red’s flagship touring rig also increases comfort and ease of use offering riders the best of all touring worlds. Four-plus decades and 798,000 Gold Wings later, the new GL continues to be the gold standard when it comes to whisking riders from destination to destination. 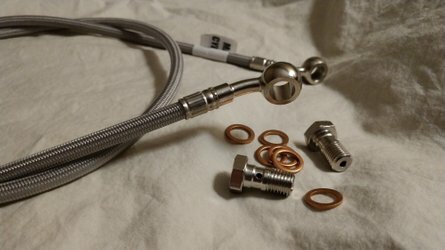 Physical build: Getting that Gold Wing bod! 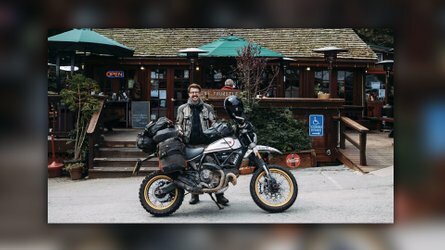 Experience: A life-long motorcyclist, the only thing Adam loves more than being in the saddle is inspiring others to do the same.